I'm dreaming of the day I can really consider myself a work at home mom. Blogging has brought me into contact with wonderful women who have succeeded in making that possible for themselves. A few are actually helping empower other women to do the same. 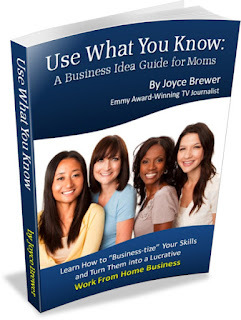 Joyce Brewer, creator and host of MommyTalkShow.com, has published a unique ebook titled "Use What You Know: A Business Idea Guide for Moms." Joyce, an Emmy-award winning TV Journalist and former TV anchor, is also a wife and became a work at home mom a few years ago after the birth of her son. Like us, she wondered how to use her skills to make an income from home. Years later, her business idea has become reality and she's sharing how we can do the same! Her book is a business guide on how moms can also become work at home parents WITHOUT paying ridiculous amounts of money upfront. She begins by letting the readers in on how she did it. Then she goes on to show how other successful moms have done it in a series of interviews. These moms come from different career backgrounds and come across so genuine and relate-able. Included in the book are resources for creating and maintain your new business as well as exercises to "Business-tize your skills." The entire ebook is printable so you can write out your answers to the exercises and plus sometimes it's just nice to have a hard copy. Plus, there are links to several of Joyce's videos. I love that Joyce builds moms up. It almost feels like she knows our potential and wants to help us get there. If you are like me and have the desire to bring in an income while still being available at home for your children, then this book is a must read. The business ideas included in the book are eye-opening. There are so many things that we are good at but don't necessary consider it a skill. This book helps you to evaluate ALL of your talents no matter how small they may seem. It it very easy to read (none of that super complicated business language) and is one that I will be rereading often. "Use What You Know: A Business Idea Guide for Moms" retails for $12. Exclusive for YW&M readers: Use coupon code "YWM" at checkout to take $2 off the $12 price! Expires Saturday, August 4th at 10 p.m. Click here to visit Business Idea Guide for Moms..
Disclosure: I previously purchased this book on my own. The sponsor has offered to give away a copy of the book to one of my readers. This post contains affiliate links. GIVEAWAY: Joyce would like to give one of my readers a copy of her business guide! Ends on July 26th. Good Luck! REMEMBER: If you're not selected as the winner, or just want to go ahead and get started on your business idea, don't forget to use that coupon code before August 4th and get yourself a copy of the book for $10! Click here to visit Business Idea Guide for Moms.